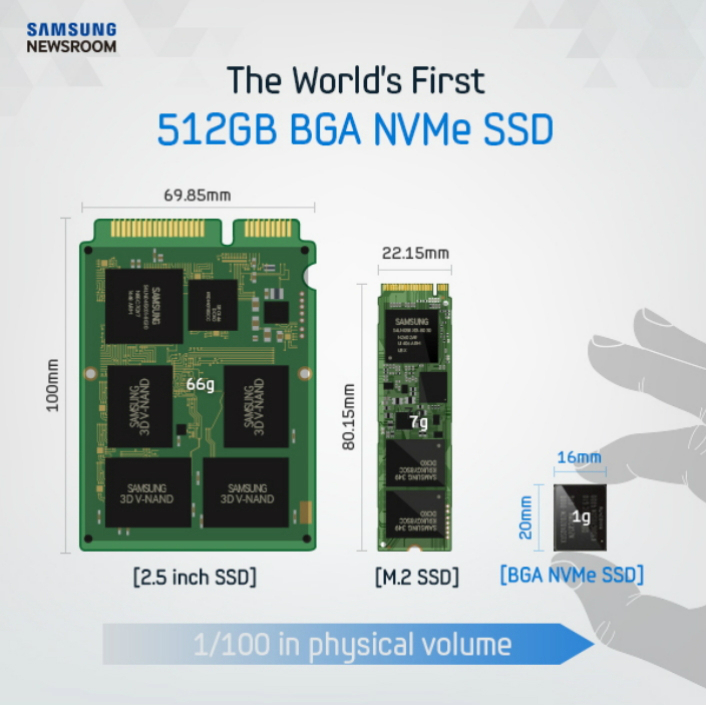 Samsung Electronics, the world leader in advanced memory technology, announced today that it has begun mass producing the industry’s first NVMe* PCIe solid state drive (SSD) in a single ball grid array (BGA) package, for use in next-generation PCs and ultra-slim notebook PCs. The new BGA NVMe SSD, named PM971-NVMe, features an extremely compact package that contains all essential SSD components including NAND flash memory, DRAM and controller while delivering outstanding performance. 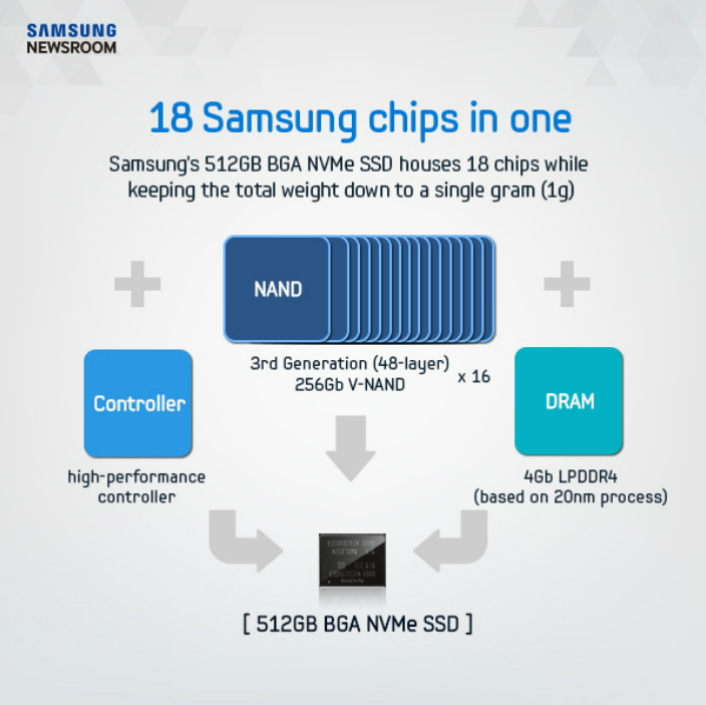 Configuring the PM971-NVMe SSD in a single BGA package was enabled by combining 16 of Samsung’s 48-layer 256-gigabit (Gb) V-NAND flash chips, one 20-nanometer 4Gb LPDDR4 mobile DRAM chip and a high-performance Samsung controller. The new SSD is 20mm x 16mm x 1.5mm and weighs only about one gram (an American dime by comparison weighs 2.3 grams). The single-package SSD’s volume is approximately a hundredth of a 2.5” SSD or HDD, and its surface area is about a fifth of an M.2 SSD, allowing much more design flexibility for computing device manufacturers. In addition, the PM971-NVMe SSD delivers a level of performance that easily surpasses the speed limit of a SATA 6Gb/s interface. It enables sequential read and write speeds of up to 1,500MB/s (megabytes per second) and 900MB/s respectively, when TurboWrite** technology is used. The performance figures can be directly compared to transferring a 5GB-equivalent, Full-HD movie in about 3 seconds or downloading it in about 6 seconds. It also boasts random read and write IOPS (input output operations per second) of up to 190K and 150K respectively, to easily handle high-speed operations. A hard drive, by contrast, will only process up to 120 IOPS in random reads, making the new Samsung SSD more than 1500 times faster than an HDD in this regard. The PM971-NVMe SSD line-up will be available in 512GB, 256GB and 128GB storage options. Samsung will start providing the new SSDs to its customers this month worldwide. As a leading SSD provider, Samsung has a history of introducing advanced SSDs ahead of the industry. In June 2013, Samsung introduced XP941 SSD in M.2 (mini PCI-Express 2.0) form factor (80mm x 22mm), which was also the industry’s first PCIe SSD for PCs. Now, Samsung plans to rapidly expand its market base in the next-generation premium notebook PC sector with the new high-performance, BGA package, NVMe SSD. Later this year, Samsung plans to introduce more high-capacity and ultra-fast NVMe SSDs to meet increasing customer needs for improved performance and greater density. ** TurboWrite is a Samsung proprietary technology that temporarily uses certain portions of an SSD as a write buffer. TurboWrite delivers better PC experiences as users can enjoy much faster sequential write speeds.